We've got a few years of best practice behind us now, so here's our best practice advice for starting a new team in teamstuff. OK, kids teams and adult teams share a lot of the same problems - it's just that with kids teams you have a lot more communication needs. And that's no problem because we built teamstuff from the ground up to help for both kids and adult teams. 3. An email for each player. So this one's important - you need just one, and only one email per player. ( teamstuff can handle two or more adults per player - but when you invite them into the team - you just want to invite one ). And that's it. Without doubt the hardest part - making sure you have one email and only one email per player. And yes - that's not that hard! Signup, or login to teamstuff on the web. Then look for the 'new team' icon, and we'll walk you from the process. It's really easy - because we've tried to make it as easy as possible. then invite the players. Since this is a kids teams, we want only one parent to be invited per player. Later on, either the parents or you can help get second parents setup. But right now, just do one email per player. The wizard guides you through the process. If one parent has multiple kids - no problems - just invite them once - they can add 2 or more kids when they accept the invitation. If you have kids playing in this team - try using the word 'me' instead of an email - nice short cut for adding your own kids. 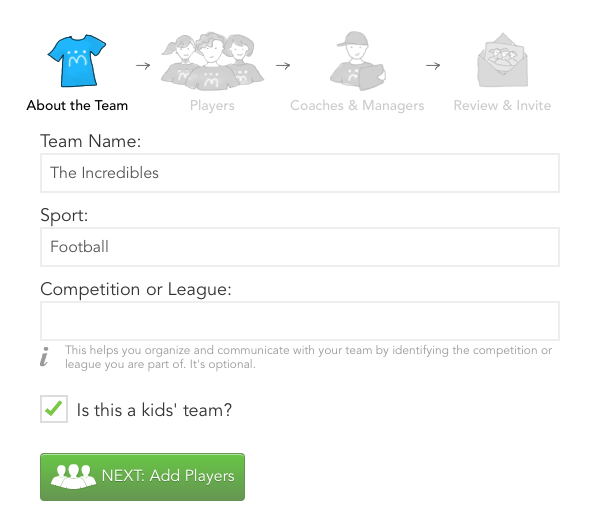 Great - when that's done, teamstuff will send out invitations by email to each player, coach or manager you've invited. Each email contains a unique key that needs to be used by that person to get into your team - we're pretty focussed on security here in teamstuffland. By the way , those emails go out pretty much immediately. Whilst you're waiting for responses, set your team up to run the way you want it to. That's the team preferences section - which only coaches and managers have access to. In the example below I've set the team logo ( hint : mouse over the logo area to update it ). To change any team settings - just use the pencil icon near the word Team Settings. These preferences can be super powerful for helping you run your team. 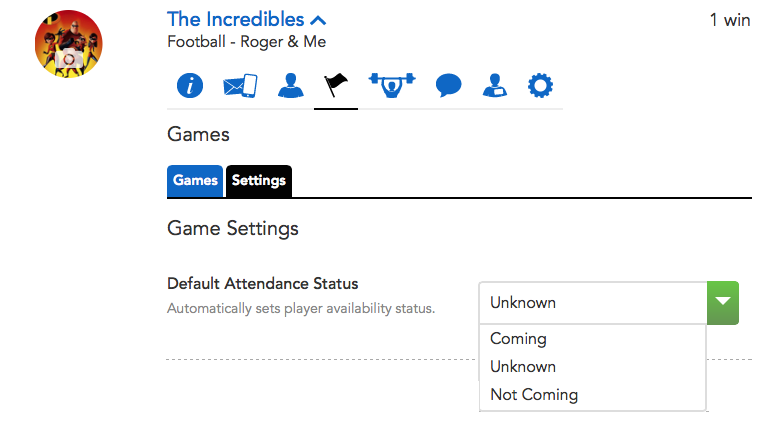 So these options control the default attendance settings for your team members when new games or trainings are added to the schedule. We think the best setting for games is to use the 'unknown' preference. This then means if the player's attendance is then set to yes or no - you know that they or their parent has consciously made that decision. The unknown status also allows you to remind those that haven't answered whether they are coming or not - so it's definitely our preferred way to go. But remember - it's your team - you set it up the way you need it! Note that the game preferences can be found under the games listing for your team - settings tab. Trainings preference are under training. Again, only the admins in the team will see that choice. OK, the last 'setting' I'd look at ; is to create your own team's magic email. The magic team email is an always up to date distribution list. You send an email to that address - and we send it on to whole whole team. All the players, parents, coaches. Everyone. You'll never need to do 'reply-all' ever again to keep a distribution list up to date. 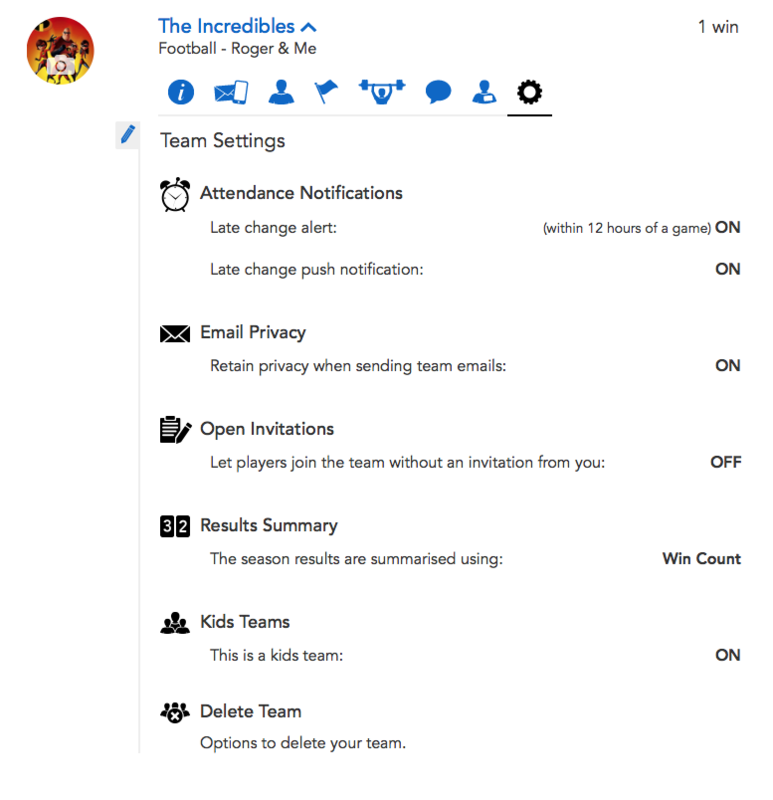 In the case above - I've created the email of theincredibles@my.teamstuff.com - and that's the only email I'll ever need to remember for this team. Oh and by the way - you need to be a member of the team to use that address - spammers not so much. So the next tip has nothing to do with features. A lot to do with people. From here - work quietly but firmly with your team to get them on board. Like most activities, you'll get a range of responses. Some will jump on board straight away, some in a couple of days. Some will want team communications 'the old way' - whatever that was. At this point, it's good to remember that you're almost certainly one of the team volunteers doing the most work. Teamstuff is going to save you hours of your time, so it's pretty reasonable to ask your team members to help you help them. Get on board - and there's no excuse. In short, we can communicate to your team members by email,web, iOS app, Android app, text messages, push notifications. Calendar integration. Today Widgets. So there's a massive set of ways for people to get the information they need when they need it. So be firm : get one way to communicate with your team - that's teamstuff. Now that you're up and running - add your games and training sessions. The system will take care of the communications for you - communicating games coming up when users want them. So add the games in once you know them. Add duties for your games across your parents. And good luck for your season!